 The past year has been a good one for small boats and daysailers, but even in a crowded field, the Tartan Fantail stands out as something special—a boat that is elegant, practical and, best of all, a whole lot of fun. 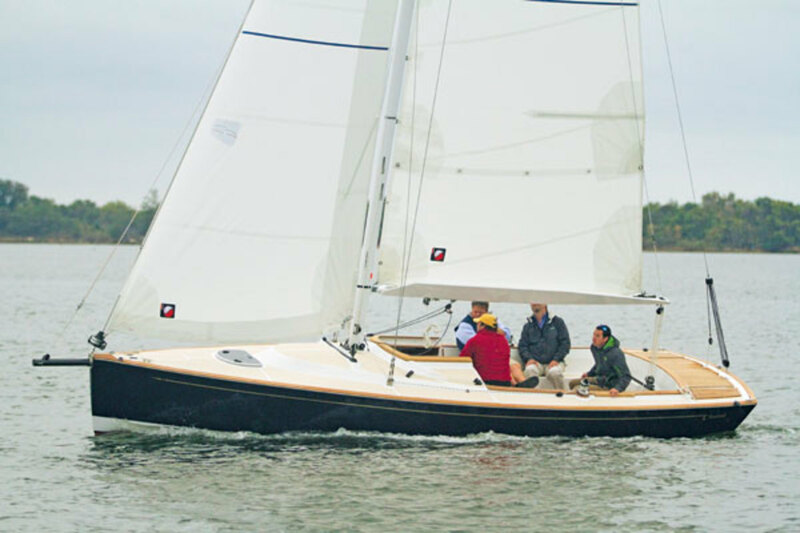 By giving the Tartan Fantail a nearly plumb bow, an elegant sheer line and the dramatically raked transom that provides the boat with its name, long-time Tartan designer Tim Jackett was clearly looking to make an aesthetic statement. 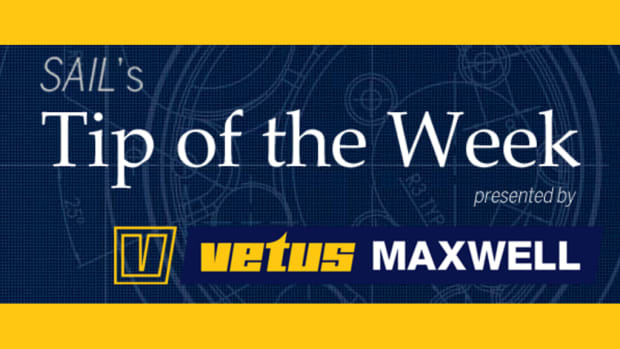 By giving the boat a fine entry, a tall rig, a deep fin keel, a retracting carbon bowsprit and a high-aspect spade rudder, it’s equally apparent he was looking to make a performance statement as well. I distinctly remember seeing the drawings for the Fantail back in 2011 and thinking: this is one boat I’ve got to sail. Fast forward to the fall of 2012 and an absolutely perfect morning on Chesapeake Bay, with the boat slicing effortlessly to windward at around 5.5 knots in 10-12 knots of wind. The motion in the chop was smooth and predictable. 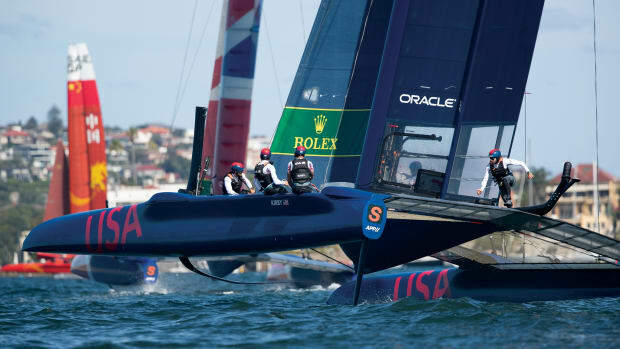 The boat came about crisply, and thanks to its self-tacking jib, with minimal crew effort. At one point, the 353ft2 of sail overhead started taking over in the gusts, forcing me to use some extra muscle on the helm. Designer Tom McNeill—Jackett’s successor at Tartan Yachts—wondered aloud whether the boat could maybe use a bit more rudder. But I disagree. It was just a matter of getting used to the way the boat likes to sail. 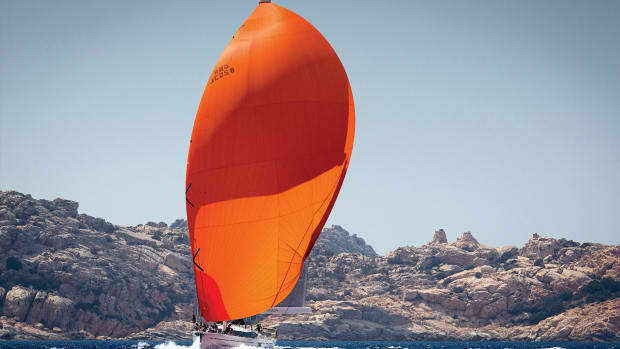 Falling off onto a reach, we unrolled the asymmetric chute and were soon knocking off 7-knots-plus with ease. 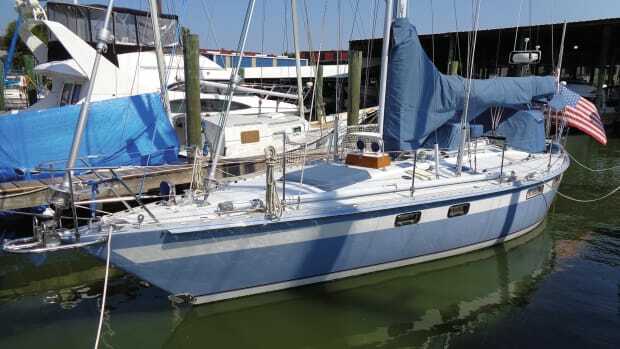 Once again, it took a few minutes to figure out how the boat should be sailed—a learning curve that was made a bit steeper by the fact that the mainsheet cleated aft of the tiller, which meant getting my arms crossed up playing the sail. (Tom speculated it might make sense to run the main to a barney post instead: this time I agree.) 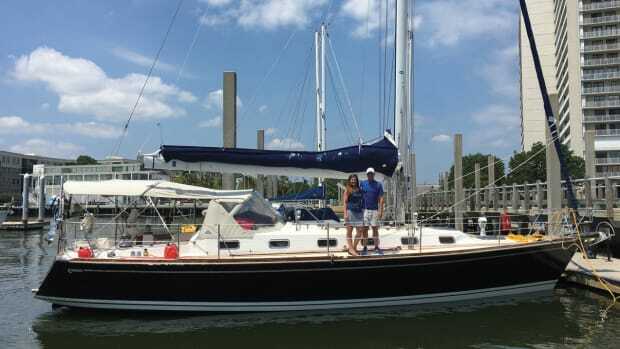 But that didn’t change the fact that the Fantail was a heck of a lot of fun to sail. 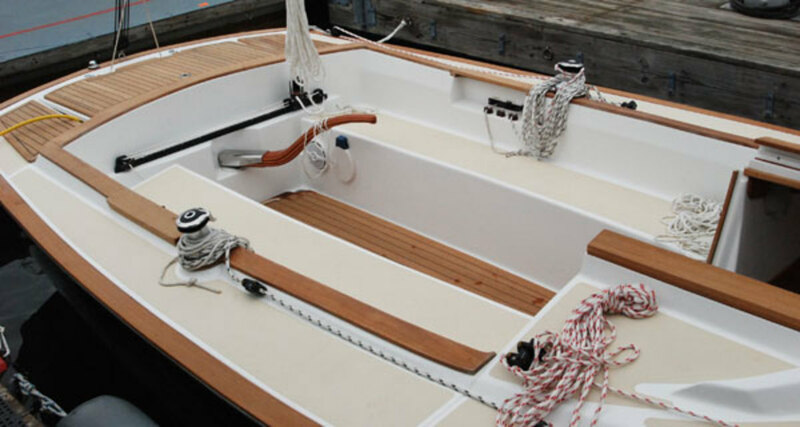 With its comfy, well-protected 9ft cockpit, this is a boat you sit “in” rather than “on,” and with 1,200 pounds of lead in that 4ft 6in keel, capsizing is never a worry. I could have kept knocking around in the Fantail all day. Like the rest of the Tartan line, the Fantail’s hull is an infused-epoxy laminate with an end-grain balsa core that boasts a high strength-to-weight ratio. 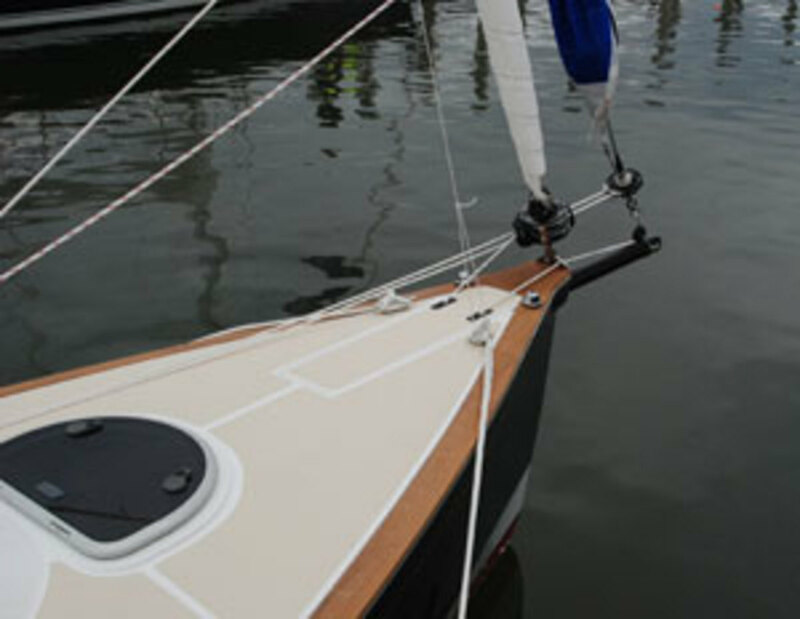 The aluminum mast (a carbon spar is optional) is paired with a composite “pocket boom” with an integral sail cover that makes dropping and furling the mainsail a snap. 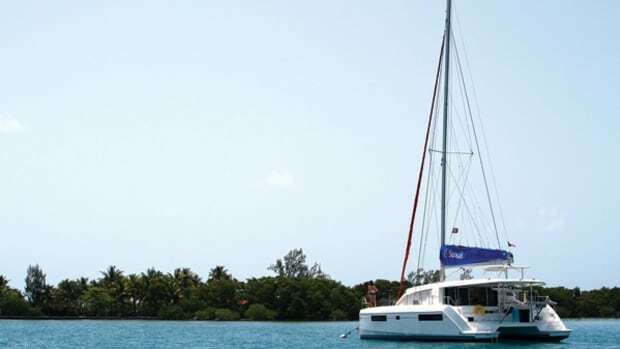 The boat is available in three configurations: a DS (daysailor) version with minimal “accommodations” belowdecks—basically a cooler and portable marine head—a self-tacking jib and a wealth of teak trim topsides; an ST (sail trainer) version that does away with the teak trim and the self-tacking jib, so that trainees with have more to do; and a WE (weekender) version, which has a larger cabintrunk for a bit more headroom, a marine head with a holding tank and a simple galley. All three share the same basic design dimensions and include large lockers under the cockpit seats for tucking away boat hooks and coolers. 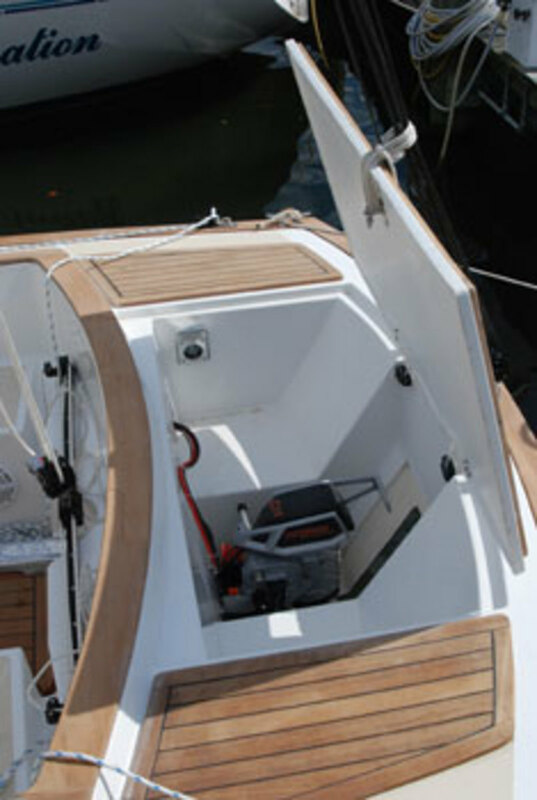 The boat is powered by a Torqeedo electric outboard in a well aft, which is controlled by a throttle alongside the tiller. 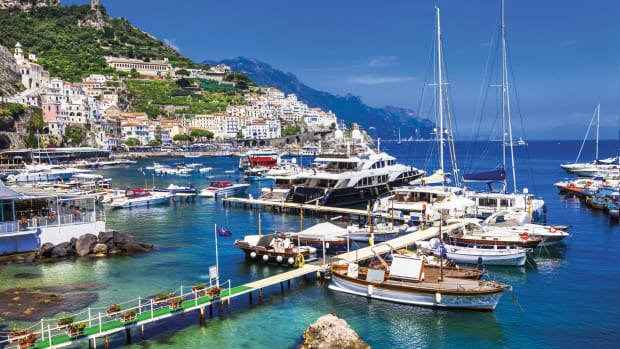 Batteries can be charged by plugging in to AC power at home or via an optional solar or wind-generator package—a neat “green” touch for a great all-around boat that is as much a pleasure to watch as it is to sail.